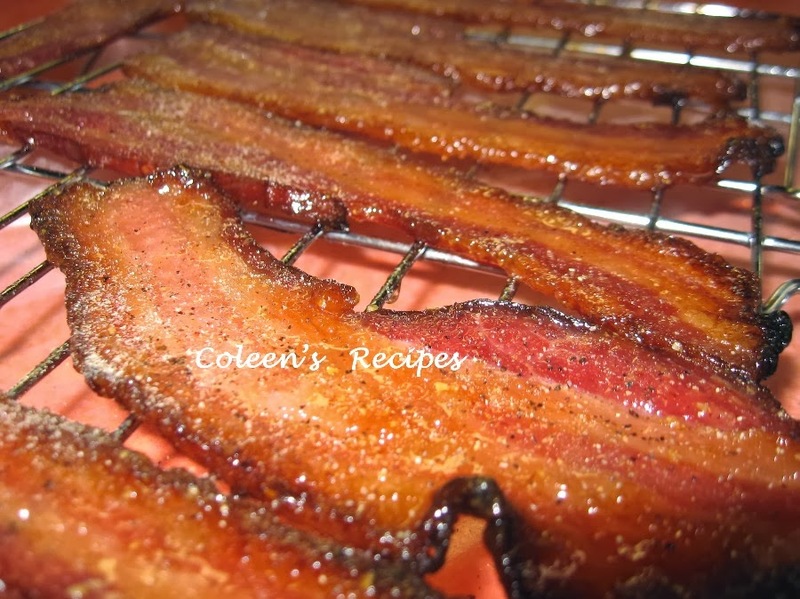 Coleen's Recipes: MAPLE CANDIED BACON !! Now I know that bacon isn't on a lot of our low calorie diets, but once in a while, you just have to live a little!! 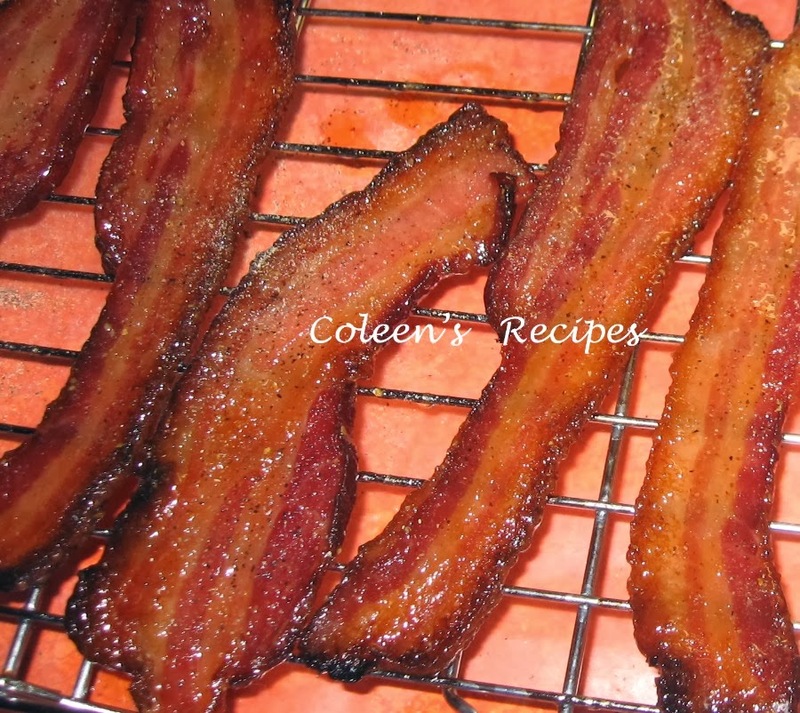 I've seen candied bacon recipes all over the Internet and often wondered what all the fuss was about, after all, what can be better than fried bacon? Well, I'm here to tell you that CANDIED BACON is the answer. Holy cow, this stuff is good!! Some people are dicing it and putting it on top of maple frosted cupcakes, some people are dicing it and putting it into deviled eggs, and some people like me who shall remain nameless, just devour it right out of the warm pan!! It's just THAT good!! There's not much of a recipe, but there ARE several tips I can give you that will help a bit. First of all, use a large cookie sheet that has a lip on it. Line it with foil (this will make clean up a breeze) and put an oven safe wire rack on the foil (make sure to spray both sides of the baking rack with cooking spray too...that will also help). Now a word about which bacon to use. Quality thick sliced smoked bacon works best, but it takes a lot longer to cook. Regular thickness smoked bacon works well but you REALLY have to watch it like crazy so it doesn't burn.......it's your choice. I think I like the thicker bacon better; I have had great success using apple wood smoked bacon. Preheat your oven to 400° if you are using thick bacon and 375° if you are using regular thickness. Mix 1/2 cup of REAL maple syrup (not pancake syrup) and 1 teaspoon Dijon mustard. Place the raw bacon slices on the baking rack, making sure that the slices don't overlap. Baste the raw bacon liberally (on one side) with the syrup-mustard mixture. 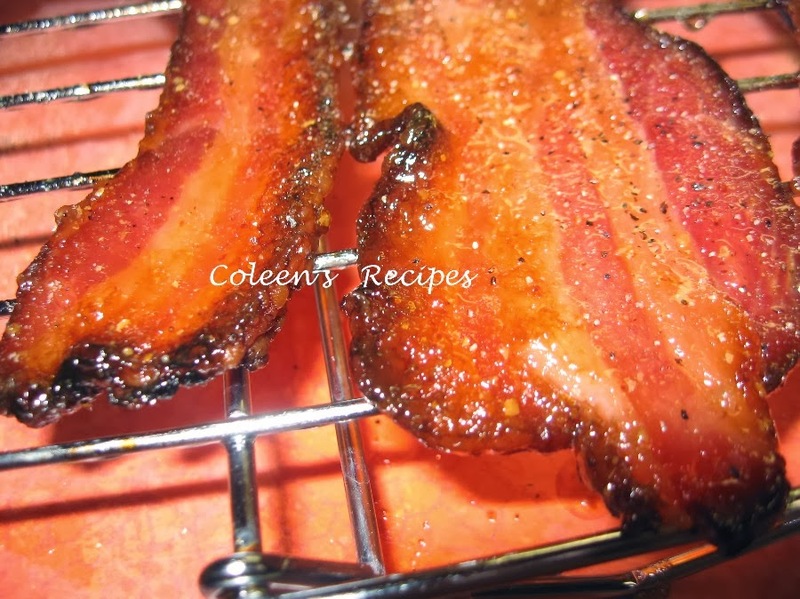 Bake thick bacon for 20 minutes and regular sliced bacon for 15 minutes. Remove from oven, flip the bacon over and baste the other side with the syrup-mustard mixture. Put back in oven and bake the thick slices for another 20 minutes and the regular slices for another 10 minutes. CAUTION: If you use the regular sliced bacon, watch it very carefully the last few minutes, because it can burn quickly if you leave it in too long. When you take it out of the oven (the last time), sprinkle it very lightly with black pepper and TAKE IT OFF OF THE BAKING RACK. I cool mine on parchment paper for about 15 minutes; unless I'm eating it right away I turn it over to make sure it cools/dries evenly. NOTE: When I am out of REAL maple syrup, I've tried this recipe using pancake syrup. It works ok too, but it burns easier and the real maple syrup tastes a LOT better. 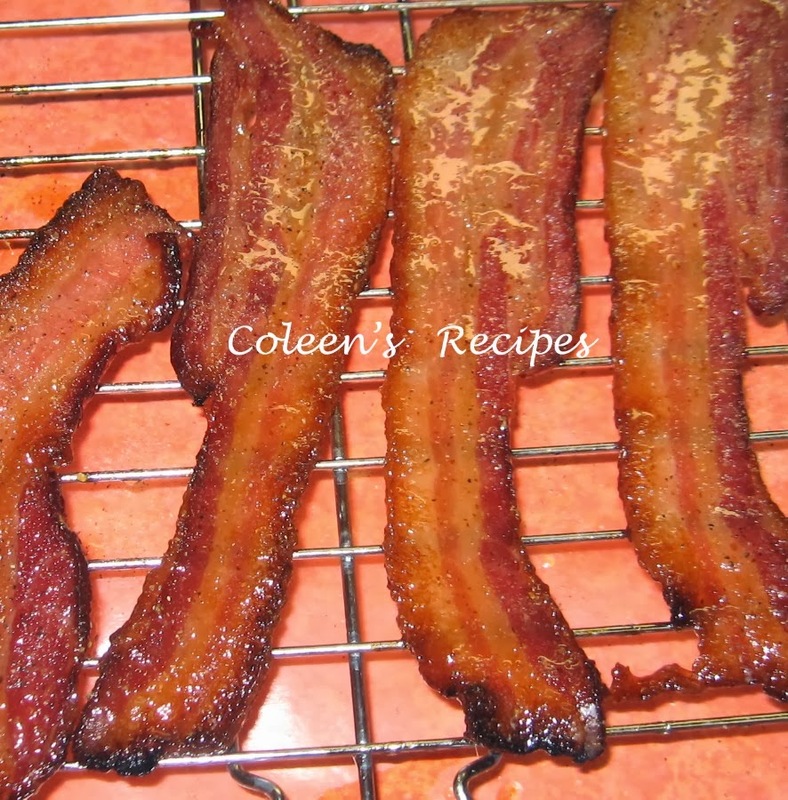 Colleen, I absolutely love thick sliced bacon and I'm going to admit, I really love the crispy fat! lol. I love that you use maple syrup as the sweetener and that you add mustard. I can bet you were eating it straight from the oven cause I know I would be. I've shared this on google plus and on facebook.